Rugby Operatic Society's production of Chess features a cast of over 70 performers, including 30 youngsters. A KNIGHT to remember is on the board as Rugby Operatic Society (ROS) prepares to stage its production of Chess later this month. The group is moving beyond its usual repertoire for its annual show this year by taking on the West End and Broadway hit. Written and devised by Tim Rice with music by Benny Andersson and Bjorn Ulvaeus from Abba, the show is a complex Cold War love story from the 1980s, set against a backdrop of political power struggles, hidden agendas and unrequited love between the players, their supporters and the political aspirations of the USA and USSR. The music, which started out as a hit album before being incorporated into the musical, includes a number of hits from the mid-80s including I Know Him so Well by Elaine Paige and Barbara Dixon, and One Night in Bangkok by Murray Head. A cast of over 70 performers – including 30 youngsters – will come together under musical director David J King and director Rex Pogson. The cast includes singers from the Rugby Philharmonic, Rugby Male Voice and the Revel villager’s choirs, members of Leigh-Anne Campbell School of Dancers, and Harris Academy vocal group Audacity. The show runs from Tuesday February 12 to Saturday February 16 at 7.30pm at the Avon Valley School and Performing Arts College theatre in Newbold Road. Visit www.ticketsource.co.uk/rugby-operatic-society or call Lucy Lee on 07732 215673 for tickets (£15 each). Tickets can also be booked via The Bradby Club, with 10 per cent of sales going to the youth club. Contact show director Rex Pogson at rexpogson@btinternet.com or on 01788 813333. KINGS and queens of Rugby Chess Club are seeking new members as the musical hits the stage. The club – which was set up around 140 years ago – is joining forces with ROS to give people the chance to play against its members or watch them in action. 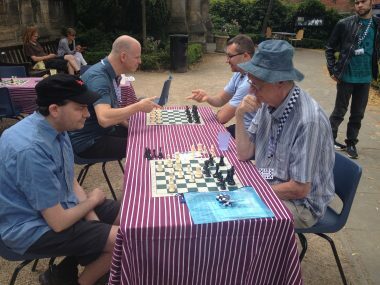 Rugby Chess Club held public events at Rugby Festival of Culture outside St Andrew’s Church last summer. Pictured are newcomer Dave Riley (front left) playing RCC president Bob Wildig (front right), as players Steve Walley (left) and Tamas Galyas (right) discuss chess. The inspiration behind the musical – the famous 1972 match between Bobby Fischer of the United States and Boris Spassky of the USSR – and its 80s setting is mirrored by the club’s history. In 1982, the club sent players to Russia to experience Cold War chess diplomacy in real life. The club’s showcase will be at Rugby Art Gallery and Museum’s Education Room from 1-4pm on the next two Saturdays (February 9 and 16). Visit www.rugbychessclub.blogspot.com or email Chris Pegler at RugbyChessClub@gmail.com for more information.